It's almost the last hoo-rah of the year. I am finally slowing down. We have one more week off from school, one more holiday and I am getting it together! Not that I'm cleaning the Christmas Tree up or anything but I'm winding down that crazy Christmas mental state we all enter and starting too think about easing into 2015. Just one more stop before I fully do that. No special plans for that Eve but I am looking forward to a yummy cocktail, some good home cooked food (of some sort) and some warm spa soaking in the backyard! If that's on your agenda too… or if you're gathering up some friends - I've got a cocktail you MUST try! First, every excellent cocktail needs a name attached to it that will either - accurately describe it or make it stand out. 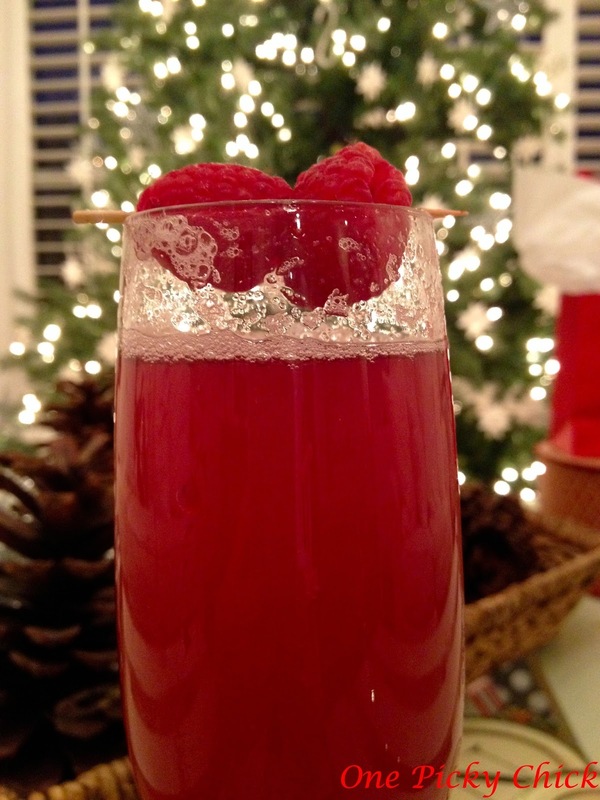 This cocktail fits the name and pairs perfectly with the holidays! 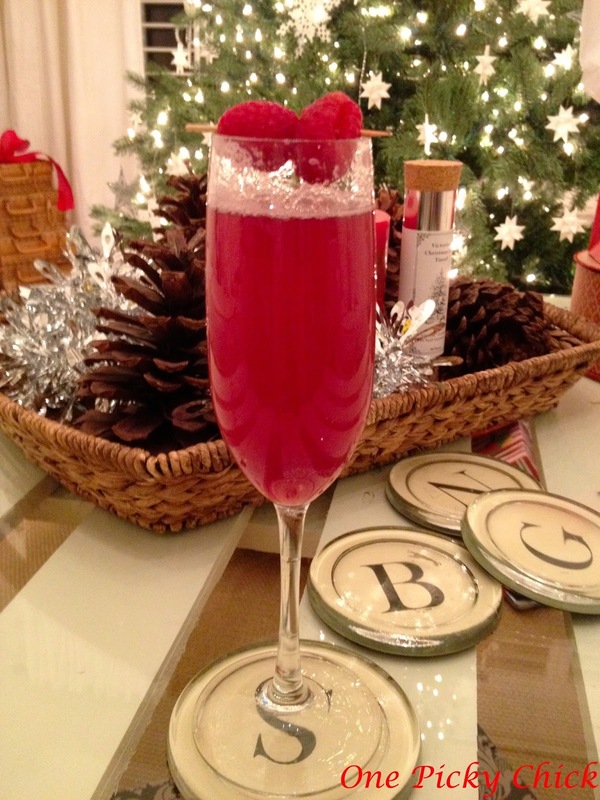 The "Sparkle-tini" couldn't be any more perfect for Christmas or New Year's Eve! It even raises the cocktail bar a bit since there's some bubbly in it… did I mention it's easy on the taste buds too? Mmmmmmmm good. We shared this signature cocktail to friends who attended our Christmas Eve Holiday Party and it was a hit! But if I had a New Year's Eve Party (ever - I do not) I would absolutely break it out for that too! 2 tablespoons (or 1 ounce) of vodka, 2 tblspns pineapple juice, 2 tblspns liqeuer, shake in shaker with ice and pour into the flute. (If making for a party do this in a large batch and pour in a pitcher, then skip the shaking until ready to pour) Then top with sparkling wine. Spear 2 raspberries and rest on top. The toothpick melts away … you barely see it. Enjoy! I like this drink for many reasons: it's gorgeous, very elegant, relatively easy to serve to a crowd and it is so very yummy. It will certainly take your night up a notch! But be careful, they're also fairly potent. You may want to stick with just one… a perfect way to ring in the New Year! Cheers. This is supposed to be the most wonderful time of the year. It's busy. Everyone is running around trying to do last minute shopping. People are preparing their holiday parties, deciding what to wear, wrapping things, kids are anticipating, hoping… maybe even peeking a bit! There is a lot to do this time of year… so much that sometimes we forget the most important thing(s). This past Sunday BP (the husband) asked if we were going to church? I answered, "I'm not sure we can… we have so much to do…" to which he replied, "we can go to church!" Yes, if you're a Christian - the important thing coming up is that it's Jesus' Birthday on Thursday, December 25th. That's huge. 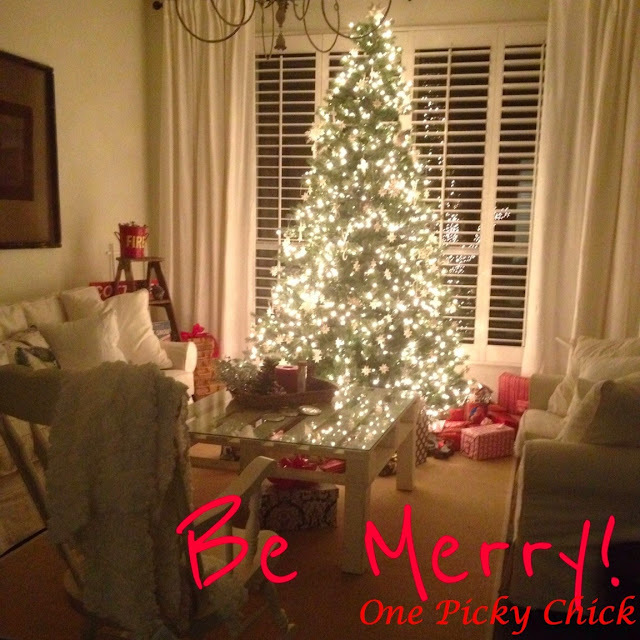 If you're not - the general reminder still applies to you: Be MERRY! Remember that? Holly and Jolly? Happy and Healthy? It's time to enjoy the fruits of your 2014 labor! So why is that so easy to forget? In my household… we haven't even done the yearly trek around the neighborhood looking at the beautiful Christmas lights. Yep, for many of us, it's just too easy to get wrapped up in all that is - this time of year. Hooo hooooo hoooo…. he's got some lungs on him, huh? Sorry for the shaky camera work. In the middle of that read my son decided it was time to take off his night clothes. I was trying to get him to put them back on. It didn't really work. We had to change entirely when we finished the book. He said they were itchy. Bottom line, it is a beautiful, special and incredibly magical holiday... especially if you're blessed enough to be surrounded by children! Especially if you're not hosting a huge Christmas Eve Party, ha. Please enjoy some, if not all, parts of the day… the week… the rest of the month. Hmmmmmm… maybe I should hire a caterer next year? Sure. Yes, my friends, Be Merry! Be very very Merry! These are amazing Christmas sides. I love Christmas. Who doesn't? But I will say, in our house, Christmas is kind of the ugly step sister to Christmas Eve - in terms of our menu. The reason is simple. I concentrate so much on the Christmas Eve party. All my focus is there. So Christmas dinner kind of gets... lost. I only have so much capacity in my brain. Honestly, sometimes I just want to serve pizza. One year we did. Really. It was the year we found out we were moving into a new house… like the week after Christmas. But again, no matter what the year.. my menu on Christmas has to be simple. But good. Almost as if I slaved for hours but alas, I did not. Last year, we made these 2 - out of this world - sides. 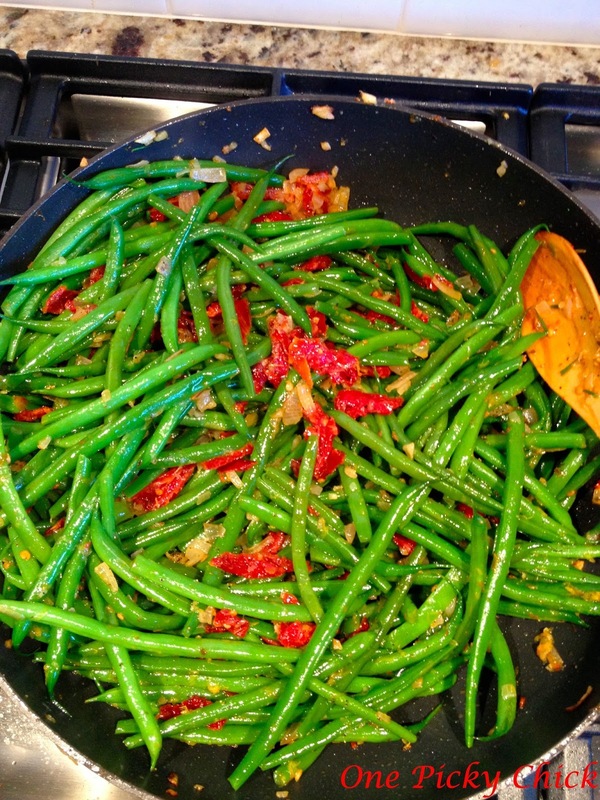 The first…Green beans with sun dried tomatoes! Get it? Red and green. Love the festive-ness of that, right? See, I always struggle with vegetables. Sometimes it's hard to make them taste, well, good. They're often the most overlooked and boring part of a meal. Well not this time my friends. I'm telling ya… you can NOT go wrong. Even my Mother in Law loved these babies. AND they only take like 10 minutes to do. Saaaa-weeeet! 1 cup sun dried tomatoes, "chopped"
Boil a large pot of lightly salted water over high heat. When it reaches the full boil… add the green beans and cook for only 2 minutes. While that's happening, put ice and cold water in a large bowl. After the 2 minutes, drain beans and put in the ice bath. The beans will stop cooking that way. In a large skillet, heat butter over medium heat. Add shallots and sauté. Couple minutes. Add tomatoes and cook for another couple minutes. Add beans, lemon zest, about 1 1/2 tspn's salt and 3/4 tspn pepper. Cook until beans are warmed through. 5 minutes or so… done. Look at how beautiful there are. The colors are stunning and so appropriate! Plus, they have a yummy, surprising and zesty flavor. Oh my gosh - it's like another Christmas gift - but for your tongue! One of the best veggie dishes you'll make. It will not be boring - in fact prepare - it could assume center stage. This side NEEDS some excellent meat by it in order not to over shine! 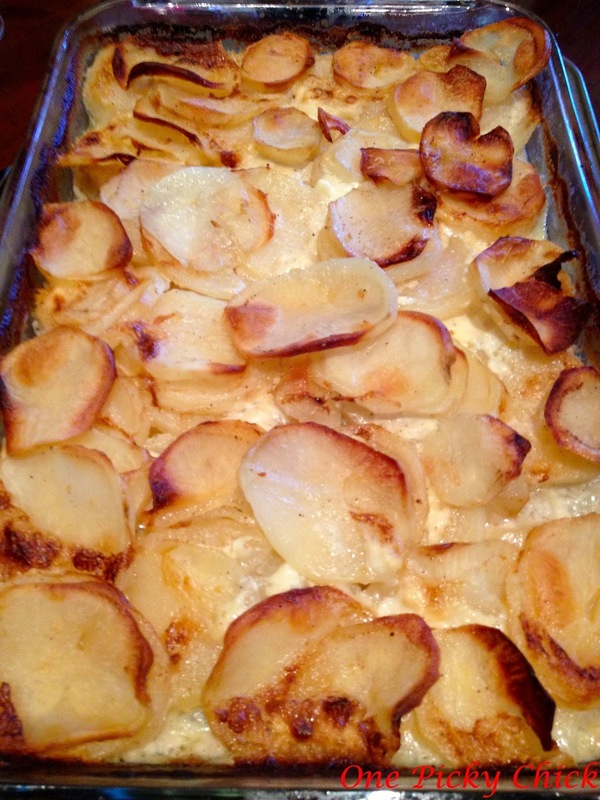 Then there's this… horseradish scalloped potatoes. It goes really well with red meat and actually with the beans above. And yes ladies and gentlemen… it too takes 10 minutes to prepare. You're welcome. Heat oven to 375. Butter bottoms and sides of a shallow baking dish. 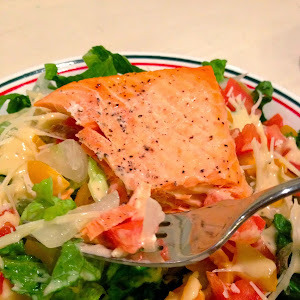 In a bowl, combine cream, horseradish, about 1 1/2 tspns salt and 3/4 tspn pepper. Add potatoes and coat with mixture. Put it in the baking dish. Cover dish with foil and bake for about 25-30 minutes. Remove foil and bake another hour or until top is golden and crispy looking. We did steaks to accompany the sides. The whole meal was excellent and super "Christmas-y"… but if turkey and stuffing is your thing on this holiday these could fit in to that scene too! What your Car says about you…? My car is on its last leg. I've had it for 10 years. But is it who I am? Let's just get one thing straight: your car is not who you are, not even a reflection of the person inside... you are waaaaaaaay better than the piece of metal you drive. Right? Your car may be something you like but not any more than that. Hmmmmmm... I dunno, you sure spend a lot of time in it. IE: You bring home babies from the hospital in it. You move homes with it. It becomes, in a weird way, a part of your family. That is… if you keep it for as long as I've kept mine! Yep, friends... I bought my car in 2004. It was close to brand new. We drove it to the Grand Canyon a couple weeks ago and it died in my driveway after we got home. No joke. I spent $800 on it and then it died again, for another reason, the following week. I had to get towed twice in one week. So, then I spent another $500 and it is apparent to both of us... it is time. Time to get something new for me and my children. It's still an awesome car but just for someone else. Yet for me - it's hard. For several reasons. Life changing things happened in that car. I drove both kids home from the hospital, we moved into our current house - like I probably brought over 10 loads of stuff over the course of 1 month in it. We traveled to California in it. Multiple times. I drove, in the middle of the night, to multiple crime scenes/fires and one long prison stand off during my time in TV news in Arizona. Yea, the memories are grand and the list of them are long. Plus, I am one nostalgic dame. It identified ME well. 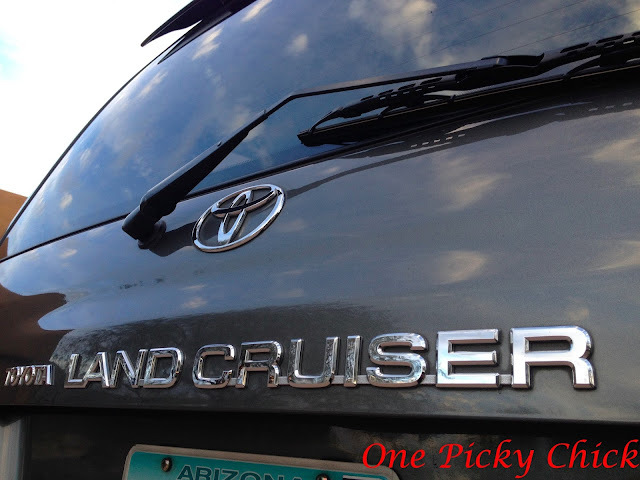 I'm not sure what the LandCruiser says about the driver but I was proud to be one. Classic not trendy. Very nice but not stuffy. Cool and individualistic. Eye catching yet not overwhelming. Big but not massive. Expensive however not ludicrous. It was very me. Wait, I'm not trying to say I'm super cool… or big either. You get my drift. Getting rid of 1 car means you have to find another! This is the hardest task of all. 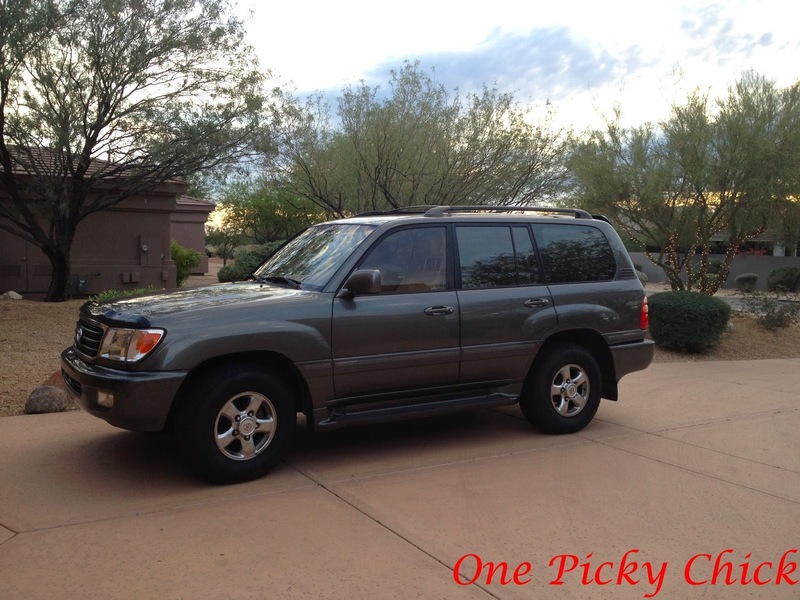 What car will become a part of my family from this point forward? 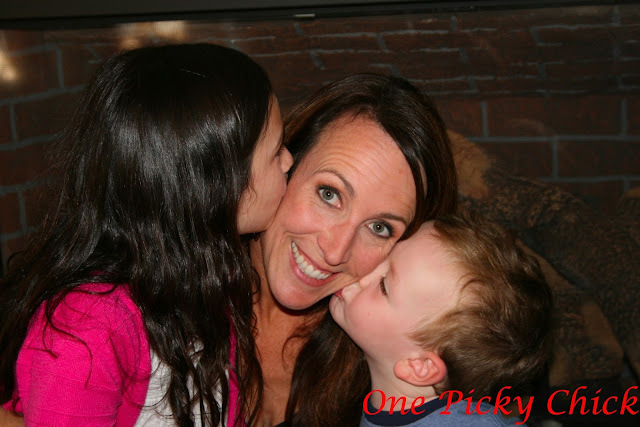 I AM One Picky Chick, you know? Inevitably, back to the title… "what does your car say about you?" It may blurt out who you are before anyone ever lays eyes on you but should that matter? For (an old) example, take the convertible Volkswagen Cabriolet. Circa 1990. Remember that car ladies? It was the classic "cheerleader in the 90's" car. I was a cheerleader. In high school and college, even though I loved that car, I refused to get it. I would turn my head as it passed in front of me on the streets and I secretly longed for it. But I didn't want the stigma that was attached to it. Eventually, however, I caved. I got it. And guess what? I loved it. I'm glad I got it. No matter what it said about me. I was happy, maybe even a bit "peppy," as the car would indicate... but no matter. All was good in my world as I drive the red car with a black top. What you say? What are you talking about? Don't play dumb, you know exactly what I'm talking about. Everyone has pre-conceived notions about others. For instance, name some current stigmas attached to cars... Mini-van = parent with lots of kids? Range Rover = Housewife of Orange County, Beverly Hills or New Jersey? Toyota Sequoia = Sturdy, solid, sports on the go parent. Mercedes SUV (3 rows) = old (money) or influence. We could go on and on… but the truth is your car should only speak to you. Who cares what it says to others? So I am now in that very weird place of trying to find a car. And yes, I know it's the holiday season and it's the last thing anyone has time for. But here I am toodling around going to dealerships, making phone calls and looking on the internet… you may ask where BP (the husband) is? And that would be a valid question but the answer is: always working. I even test drove HIS cars when he got one earlier this year! Wish me luck. I need it… my list of likes isn't too long (don't say it - I know what you're thinking)… I have narrowed it down to -- I would say 4. I just drove 2 and liked the inside of one but the outside of the other. Another seems impossible to find and the other is here and there… it's just finding the right fit exactly. Kinda like marriage. Wait...? Once I decide… I will then ask myself the internal question of: what does this (new) car say about me? And then I will promptly remind myself - whatever... I... want! Christmas Eve is a week away. I need to get my party menu together. If you need some ideas - try these. I think I've been very clear over the last year… I am a planner. So when I do a party, I think long and hard about the details. That clearly includes the food that will be served. I'm not a fan of going to a party and having it seem to be similar to your stroll down the Costco food aisles. You know, you get samples of all their hot sellers - the old men (aka: my father) stand in line and block your way so they can nab the freshest taste! Very irritating. Sorry, love my father, can't stand his Costco "sampling" etiquette. Now don't get me wrong, while I love most of the Costco products, when you come to a party at my house I want you to experience other foods. Hence, the menu I labor over! As always, I like the food to be seasonal. Meaning I won't be serving bean dip and watermelon margaritas. Cranberry Marg's… maybe. But they have to fit the theme. Much more fun that way. Therefore, here are 2 eye catching and yummy recommendations I would add to any Christmas party list! 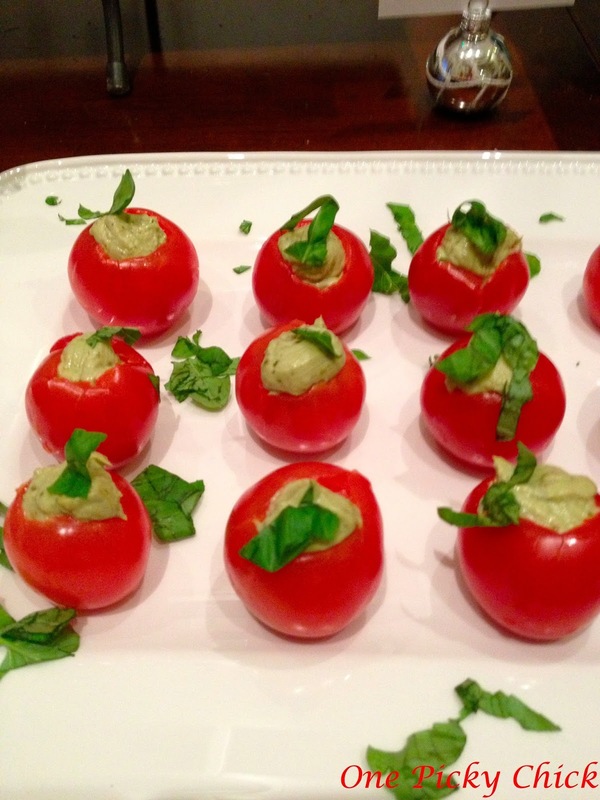 First, the red and green bite size appetizer. Is that gorg or what? 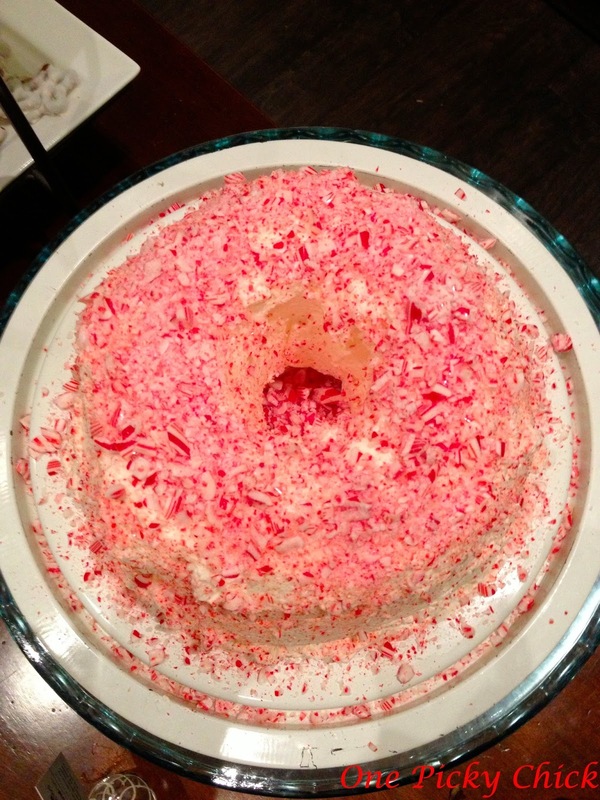 So festive and yet so yummy. It is a little labor intensive, so I only do about 30, but it's worth it. They make a statement, and because it's healthy, people usually take just one. 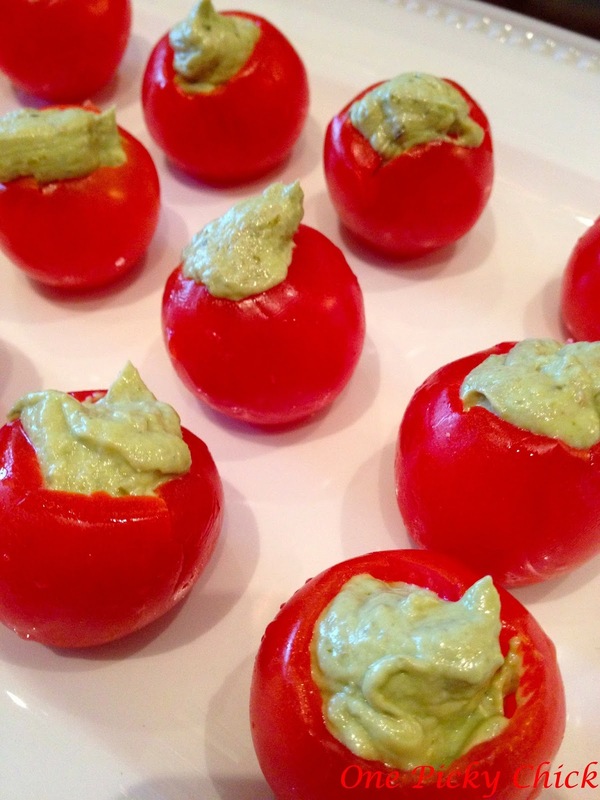 Yes, partygoers love to indulge on this day and the thought of a tomato might just send them over the edge - too good for you. People are ready to live it up on this night! Which is great for me. Therefore, more people get to try the master piece! Wash and cut a thin slice of the tomato from each bottom. Be careful. They're delicate. That's so they can stand on a platter. Then, on the top end, with a small melon baller or spoon - scoop out the insides of the tomato. Throw all the gunk away. Line a baking sheet with paper towels and stand the tomato (top down) so the insides can drain. 20-30 minutes. While that's happening, combine half the avocado, cream cheese, pesto, lemon juice and mix in a food processor. Taste and decide if you want to add the rest of the avocado. Then put the filling in a big baggie, cut the corner and begin to fill the tomatoes. Almost like you're filling cupcake centers. Place directly on your serving platter. Serve immediately or refrigerate 4-5 hours. Add little sprinkles of the basil right before serving. So pretty. These bite sized pops of flavor will not disappoint! Next, bring on the desert. This is so pretty, always makes a statement and so EASY!!!! Like, so so easy. Especially if you go store bought all the way. I'll explain. Crush the candy canes with a hammer in a heavy duty baggie until in fairly small peices. Be careful with this… don't hurt a finger or break your counter! Then, in a large bowl, beat cream and sugar together with a mixer until soft peaks form. Frost cake after it's placed on what it will be served on. Sprinkle candy on top. The key to this little diddy is timing. The frosting won't hold forever. As the night goes on it will start to melt. So do this pretty close to when your party starts. Mine held for about 3 hours last year. Turn down the heat to your house, it helps. 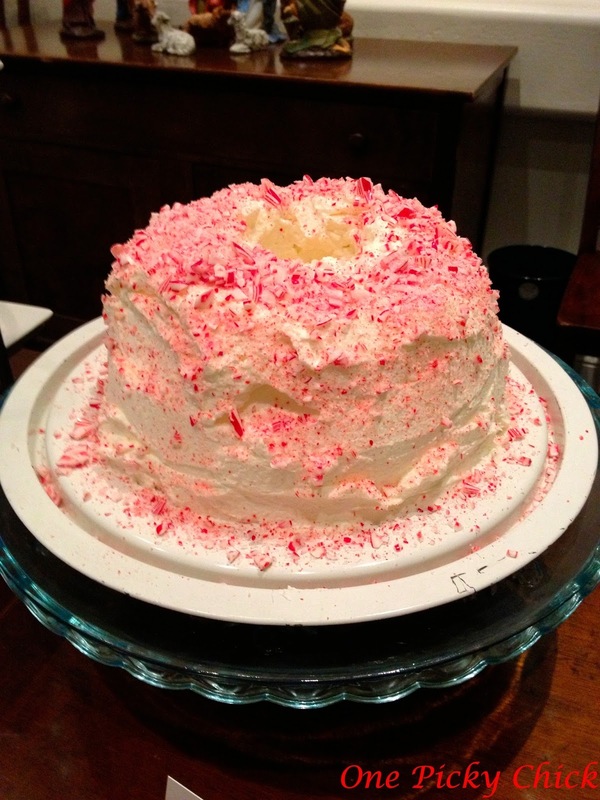 People will stay warm (through all the extra body heat from your guests) and your cake won't melt as fast! Seriously. Anyways, it's always a crowd pleaser. Catches peoples attention! How could it not? Do one or both of these food items at your party plus supplement with some meat, dips and cocktails and your party will be memorable and fun - I guarantee it! Stay tuned… I'll have some more food items as we get closer to the big day! But I hope to find mine soon. Sorry I've been so absent. I'm sure you were missing me. Kidding. I know you weren't but I truly missed writing you. See, the holidays are in full swing and the list, for us all, is a mile long. I was talking to my sister-n-law and this year she and I agree - we feel more overwhelmed than usual. I have no idea why. Well I have some ideas. But I'm not sure I'll bore you with them now. Anyways, because of that, I thought it would be a nice idea to take a moment, breath in and out and attend a yoga class with my friend. Now, I am no yogi. But I do like an occasional class. It can be relaxing. I've always liked to stretch and I usually come out of the class feeling refreshed and ready to take on -- more than before I took the class. So Monday morning I attended a class that was above my skill level but good nonetheless. Until she told everyone there that her wish for us - was that we would all find our "bun-da." She went on to explain that when she found her bun-da - her world opened up. Things were better. She was balanced, life was lifted blah blah blah. I just couldn't help but laugh a bit inside. Now I'm sure finding your bun-da, whatever that means, is awesome and super well intentioned and like a high level of something very cool but seriously - this is the holiday season - FIND MY BUN-DA? Man, I feel like finding my car keys is an accomplishment this time of year! But, I'm sure she was right, I need to find my bun-da. Regardless of not knowing what it is… I think it sounds nice. So I'm taking her advice and looking for it. I think maybe I'll see it when I look for new cars since mine has died twice in the last week alone. Or I could look for it when I make the menu for our yearly Christmas Eve party we started years ago. Better yet… maybe I'll find it when I help my kids look for Santa this year. I love the first because it showed that while I'm "One Picky Chick…" I'm not taking myself too seriously. I hardly think I know everything. Like Hardly. But I try really hard to get things right. Sometimes along the way, I fail, and that's okay too. But I went with the latter. I felt it was more descriptive of what I'm trying to do here. Wait, what AM i trying to do here? It's funny. I started this whole blog to talk about about all my outrageously picky ideas and how I make them come to fruition but along the way I started just talking. Writing about things, instances and situations. Basically anything that matters to me and, hopefully, you. 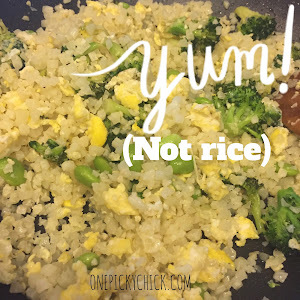 From a great recipe to a sick mom. 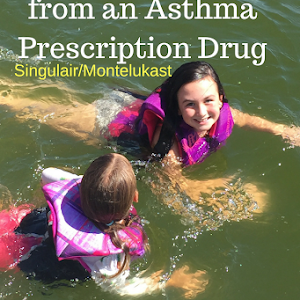 How we can maneuver through all of it and, hopefully, be okay. Because all of us only have one chance at this whole thing… it's now or never. So why not be as picky as possible? I want to be the best mom, the best wife, the best cook, the best decorator, the best party thrower, the best person - for me. Very simply, I want to be the best version of me possible. Not anyone else. Because I've only got one life. In any case, I hope you like the "new look" on my blog. I'm pleased with it and my new "tag line." If you get an email sent to you every time I write a post… you many not be seeing it. To do so, either click here or go to onepickychick.blogspot.com and you can check it out. No, it's not perfect and for a picky person that's killing me a bit inside. But I will get to it. All in good time. Hmmmm… still not sure what it is but maybe I've already found my bun-da - I just don't know it yet… Yea, I feel better already. Good luck finding yours. P.S. Tell me what you think of the new look if you get a chance! This is the month to make cookies. They are a teensy bit more labor intensive than your average chocolate chip cookie but the difference is worth your time! 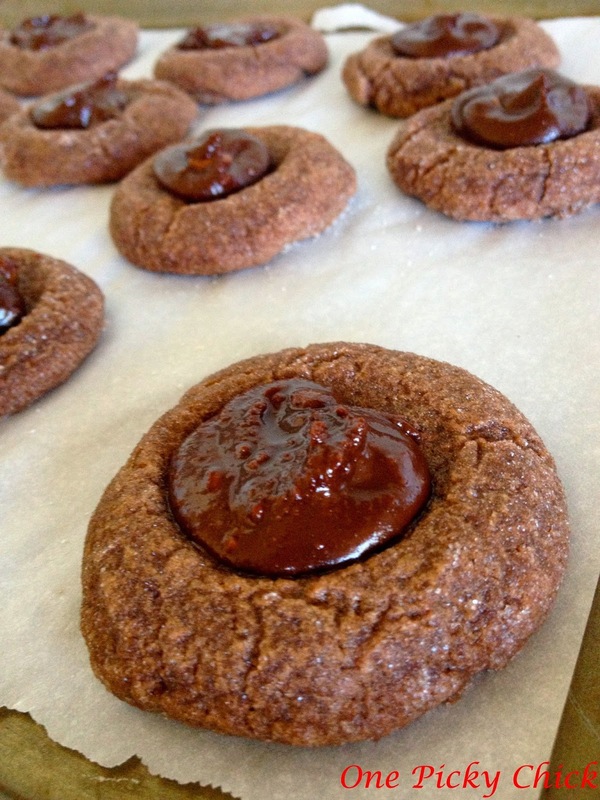 I know very few people who don't like the combination of chocolate/mint… which is why this cookies works so well! Heat oven to 350 degrees. In a medium bowl, beat 1 cup of butter and 1 cup of sugar on medium until fluffy. Add egg and vanilla, beat to combine. Then gradually add flour. Put the 1/2 cup left of sugar in a small bowl. Roll little balls out of the dough into the bowl of sugar to coat. 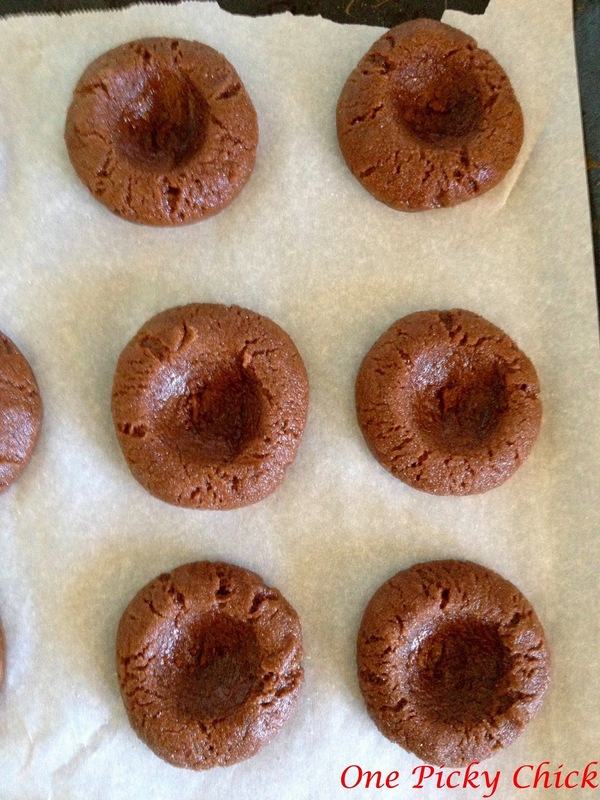 Place balls on cookie sheet with parchment paper on it. Bake for 5 minutes and remove. 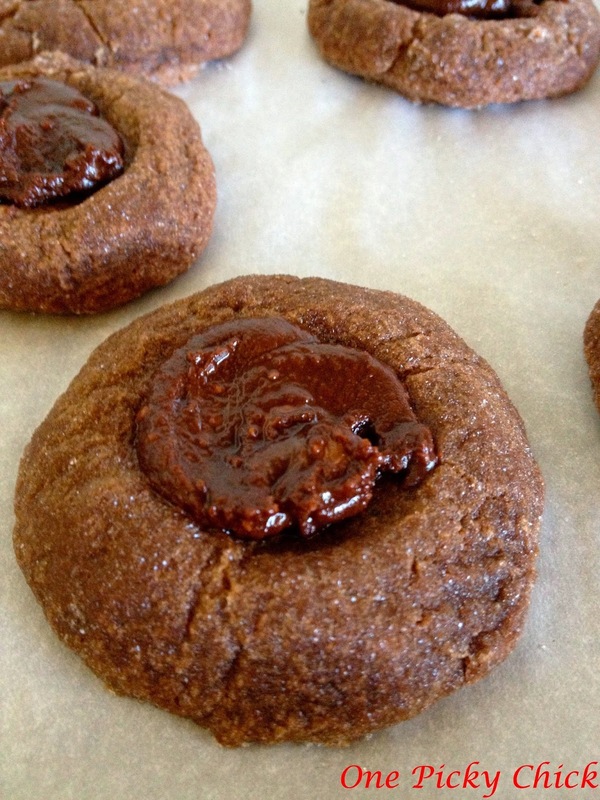 Use the back of a tablespoon to make indentations in center of cookie. Place back in oven for another 3 minutes. You want them to just set. Then take them out and let cool. While that's happening, find a microwave safe bowl and micro the chocolate chips and 1/4 cup of butter. Watch carefully and stop as needed. Once melted, stir in peppermint extract. Let cool. Then put mixture into a big baggie. Cut corner off to use as make shift pastry filler and squeeze on top of cookies in indentation. Let cool fully and serve or freeze. Guests of any kind, young or old, will be delighted by these babies. You will too! 5 Reasons the ELF Can Stay. SO why do some want to "off" their Elf? Here are 5 reason's why you shouldn't. 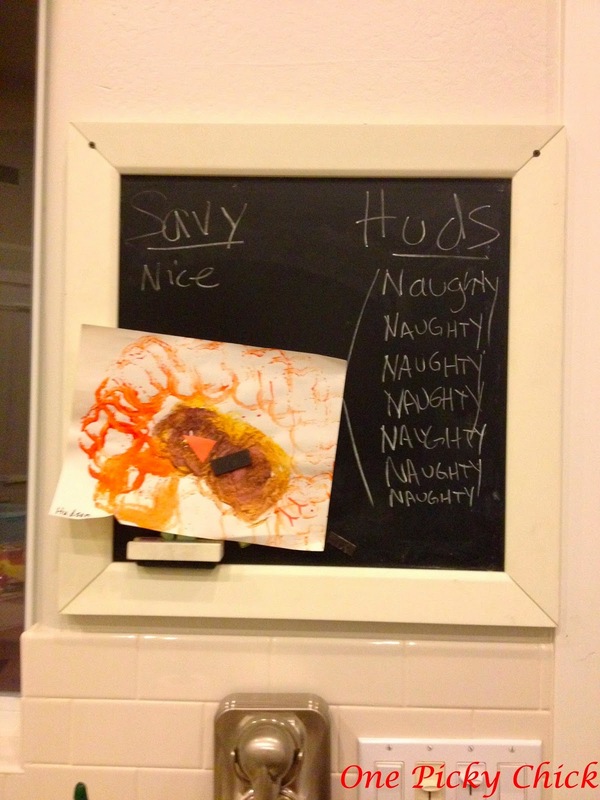 on Thanksgiving he was a whole lot of naughty. One of my friends asked what happened and I said, "nothing in particular. His Dad was just home to see his son in all of his glory!" I "cancelled" Thanksgiving because I didn't want a bunch of leftovers we wouldn't eat. See, the day after the holiday we packed up the kids and the grandparents and headed to the "North Pole" via the Polar Express in Northern Arizona. It was super cute. The kids love it. After that, we ran up to the Grand Canyon to see the wonder that is in our own back yard. It was a lot of time in the car but it was worth it. Until my daughter and I got car sick and our car broke down in the driveway - just as we got home. Ha! The last day of the 4 day weekend was spent ferociously decorating the indoors and outdoors of our house. It's a huge task. 2 trees, countless wreaths, major white lights. I am relentless. Now, most everything is done except for a few details. Next weekend. Anyways back to the topic I really want to talk about today: the ELF. It is around this time that our Elf shows up. I'm sure he's thinking about visiting your home about now too. Or maybe not. He helps discipline. 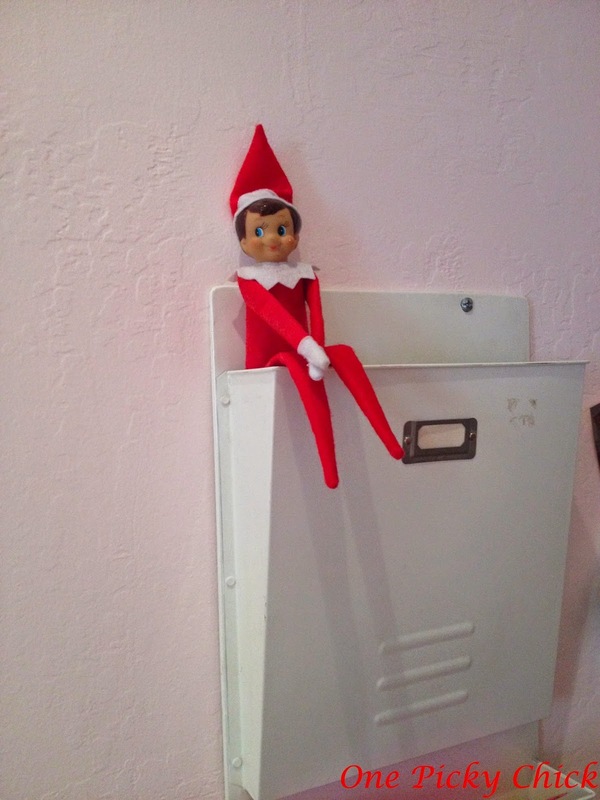 This is a very basic reason that I'm positive we have all used the Elf for… "Elf is watching - better be good!" It works. Most of the time. Some times. Okay, maybe every once in a while. You're only young once. There is a small window in which children can believe the unbelievable. It starts the day they're born and ends various times before the age of 10, depending on the child. My daughter is 8 and her innocence is starting to fade. She still believes but the window is starting to close. She deserves to spend as much time in this special place as she can. It IS a special place you know. The Elf is under my control. I call the shots. He lands where I put him. I can make my children happy with the movement of a tiny little doll and I will take that. Sooner than later, someone will call them ugly, they will fail a test, their boy/girlfriend will break up with them, they won't get into their college of choice and they may not get their dream job. And, to a certain degree, there will be nothing I can do about any of it. So while I can… I will. It's fun for adults too. Let's be honest. Part of this is for us, right? Parents are able to rewind the clock and experience the wonderment all over. It reminds us when our own innocence ruled. When you didn't have to worry about hunger in the world, fighting in Missouri, your cell phone bill, car payment and mortgage. All you had to care about in December was how many more chocolates on the advent calendar you had to eat before there were no more. Yes, my friends, the irony when you're young is you want so badly to be older. Then when you are… you desperately want to go back to your youth. Well guess what? The Elf brings back the kid in us all. Now as I said before - take or leave my reasons. Clearly, you and your family need to make your own decision. Neither is right or wrong. 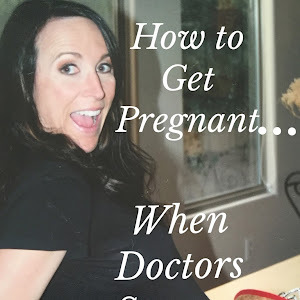 As I said before, Kristen Miller Hewitt had good, humorous points on her blog and she's a gifted, sweet and thoughtful writer - so this is by no means a "diss" on her or any other writers who may feel the same way. But as I take the opposite stance I know there are quite a few in this school of thought too. See, I'm convinced there are so many "Breakfasts with Santa," "Polar Express'", "North Pole Experiences'" "Elf on the Shelfs'" because the children who were enamored and drawn to the story of Santa… are now parents. WE are doing it. WE are demanding it. WE are, literally, buying into it. For our children and for ourselves. It's simply because there are few, truly magical times in our lives. One can hope for many but usually they are rare… that's why they're considered so special. I would bet at least one of those precious, magic moments came around the Christmas Season which is why so many of us hold it so dear. Sure, the little Elf charade is delaying the inevitable… but for all the reasons above, I am very okay with that. My wish… is that you are too!